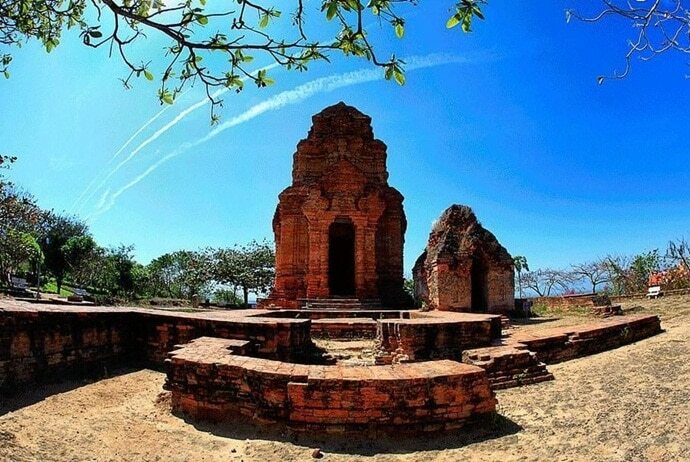 In Phan Thiet (PhanThiết), there is a place with a special Cham culture that tourists should not miss: the Poshanu Cham Tower (Tháp Chăm Poshanu). 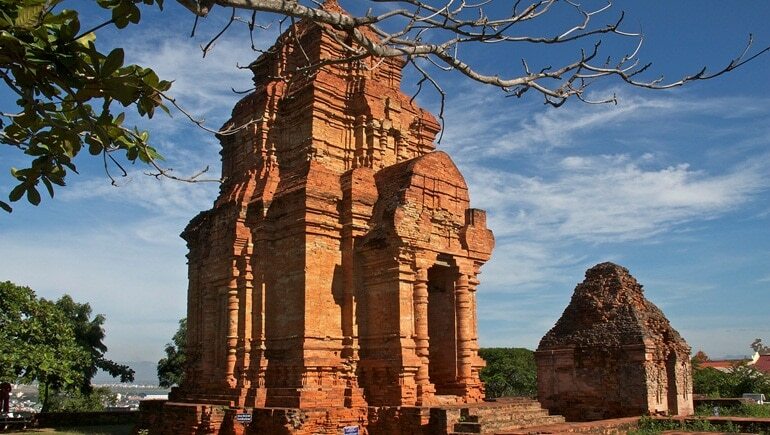 This tower is an architectural work of the Champa Kingdom with artistic, historical, cultural, architectural values, gradually became an attractive tourist attraction to the Phan Thiet City. 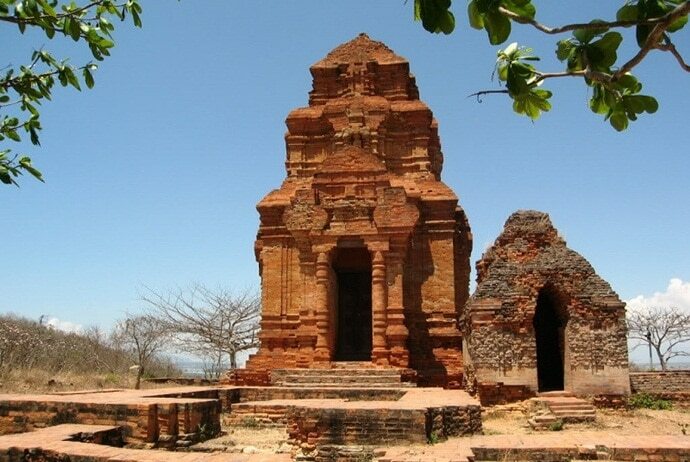 Poshanu Cham Tower is 7km away from Phan Thiet City and is located on Ba Nai Hill (Đồi Bà Nài) in Phu Hai Ward (Phường Phú Hải). You can find it atop the Ong Hoang (Mr Heaven) Building (Lầu Ông Hoàng). 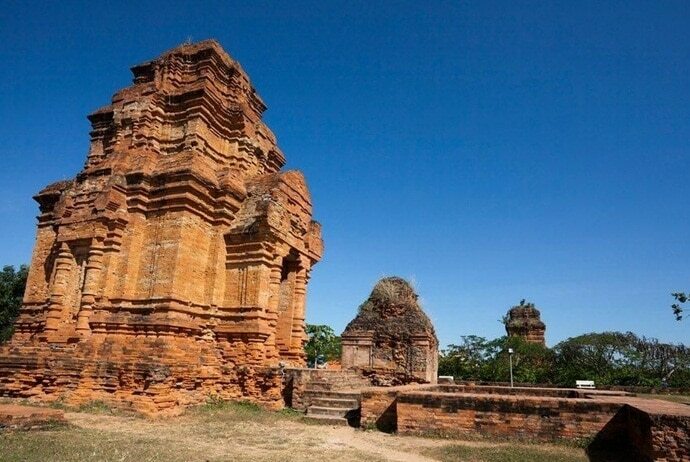 When the Poshanu Cham Tower was built, it was considered to be the great work and symbol of the Kingdom of Champa (Vương quốc Chăm Pa) at that time. The attraction of this tower Cham is the essence and art of the ancient Cham which creates unique and mysterious architectural works. Today, there are still many things about this tower that have not been found out and explained and explored. 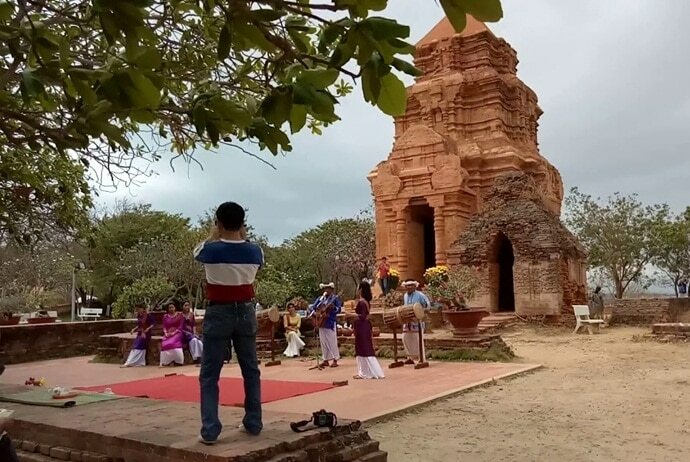 Indeed, for those travelers who have a chance to visit Phan Thiet, Binh Thuan province in Vietnam, this is considered one of the must-do things to do in Phan Thiet. During its flourishing period, the Cham kingdom left behind many valuable architectural buildings that became the heritage these days. Among them, Poshanu Cham Tower is considered a building containing the most architectural essence of the ancient Cham. Poshanu Cham Tower has many different names such as Po SahInu or Cham Pho Hai (Chăm Phố Hài). It was ranked by the Ministry of Culture, Sports, and Tourism (Vietnam) as a national architectural monument in 1991. With its fine lines and unique traditional architecture, the mark of the flourishing period of the Kingdom of Champa is still preserved on this outstanding architecture. Poshanu Cham Tower complex is a group of monumental temples built around the end of between the 8th century and the early 9th century in the ancient Champa Kingdom. At that time, this tower only worshiped Shiva – one of the most cultured and revered Hindu gods in Cham culture. Poshanu Cham Tower is also associated with ancient stories, including the deep love story of Poshanu Princess – the daughter of King Para Chanh. According to legend, this tower was built to commemorate the love of Panshanu Princess and Po Sahaniempar Warlord. Overcoming many obstacles of religious law, the princess decided to marry the warlord. But the princess’ brother did not want his sister to marry a foreigner, so he set up a plot to split the couple. On a pilgrimage, Po Sahaniempar did not see his wife waiting to greet him, so he misunderstood that Poshanu had betrayed him. Then he went to the south. Poshanu went to find her husband to explain. When she came to Ong Island (Núi Ông) – Tanh Linh (Tánh Linh), she found her husband. However, sadly he fell in love with a Raglag girl named Chargo. As a result, Poshanu lived alone in Bianneh until the end of her life. Poshanu Princess is loved by people for her virtue and conduct. She taught people how to grow rice, weave brocade, plant, and breed. In remembrance of the beautiful love of the princess and her merit, in the 15th century, Cham people built a tower complex with simple architecture. In 1992-1995, archaeological excavations discovered that in addition to the three main towers, there used to be a larger temple. However, it has been buried deep underground for more than 300 years. In 1990 – 2000 the tower was restored, embellished and now has completed the restoration. Cham Tower complex is a masterpiece that Cham people left for humanity. Poshanu Cham Tower was built in Hoa Lai architectural style (phong cách kiến trúc Hòa Lai) – the most successful and beautiful architectural style of Cham people. The tower has many doors and they all have arches. The tower’s surface has a lot of engraved pattern delicate. This architecture is also found in many other ancient buildings such as the Po Dam Tower (Tháp Po Dam), Hoa Lai Tower (Tháp Hòa Lai), and My Son Sanctuary (Thánh địa Mỹ Sơn). Although Poshanu Cham Tower is small and medium size, it carries the essence of architectural and decorative arts of the ancient Cham. These features create the majesty and mystery of the tower. Main Tower A has 4 floors. The upper floors are small and have less architectural elements than the lower ones. At the top of the tower, there are 4 triangular windows facing towards the four sides. Under each brick window, there are 4 large holes venting out. This tower is 15m high and has a long main door eastward (according to the Cham legend, the east is the dwelling place of the genie). In addition, there are three fake doors heading towards the north, west, and south. On the arch in the west of the tower, there are rows of dense carvings featured with flowers and strange images. In the tower, there is a Linga – Yoni symbol which is made of monolithic black stone. It is a relatively intact structure of Poshanu tower complex. Sub tower B is located in the north and about 12m high. Basically, its architecture is the same as Tower A; however, it is simpler. Previously, this tower worship Namdin God cow. In 1995, while excavating underground, archaeologists found a stone foot and an ear of the God cow. Sub tower C is more than 4m high. It only has one door facing the east. This tower worships the fire god. The architecture and decoration inside this tower have been eroded, leaving only some original lines. Every year, many Chams from neighboring areas gather in Poshanu Cham Tower to pray for peace. Not only that, they also perform other traditional rituals to express their gratitude to ancestors and their divine devotion which have been handed down from generation to generation. The RijaNugga and PohMbang Yang Festival take place in the lunar month of the year at the foot of the Poshanu Tower. Kate Festival with many special performances is held in July of the Cham calendar every year (i.e. from September to October calendar). If you come here these days, you will have the opportunity to enjoy rhythms of traditional instruments such as Ginang drum (trống Ginăng), Paranung drum (trống Paranưng), gong, Xaranai (kèn Xaranai), Grong (lục lạc), and Kanhi (đàn Kanhi). On weekdays, tourists visiting Poshanu Cham Tower can still enjoy Cham folk art performances which are organized by the management. Besides, you can also see the craftsman performing the weaving craft. The above are some of the highlights of Poshanu Cham Tower. Certainly, when coming here, visitors will have excited feelings about a culture that has grown quite brilliant in history. If you have a chance to visit Phan Thiet in Vietnam, do not miss this sacred destination. Finally, if you have any questions about Poshanu Cham Tower, feel free to leave a comment. We will answer as soon as possible.